The liver is one the largest organs in the body, comprising approximately 1% of the horse’s body weight. It is an extremely important organ with many vital functions. Despite having a capacity to regenerate, the liver is susceptible to injury and disease. Death of liver cells results in them being replaced with new liver cells or fibrous tissue. Replacement with fibrous tissue is a severe problem and carries a poor prognosis if wide spread, as liver function is compromised. Unfortunately, liver disease is difficult to diagnose in the early stages as signs of liver disease may not be evident until more than 60-80% of the liver is non-functional. Neurological Signs – due to Hepatic Encephalopathy = build up of toxins,especially ammonia. Blood tests can be carried out initially to look at liver enzymes and to look at liver function. The liver enzymes are: Alkaline phosphatase (AP), Gamma Glutamyl Transferase (GGT), Aspartate Aminotransferase (AST) and Glutamate Dehydrigenase (GLDH). When interpreting values of these enzymes, it must be remembered that some are not liver specific, and can subsequently be raised by other processes. Evaluation of liver function via blood tests is done by looking at the values of certain biochemical substances that are either eliminated or synthesised by the liver. These include various amino acids, ammonia, bile acids, bilirubin, fibrinogen, globulins, glucose and urea. If abnormal blood results are obtained, the liver can be evaluated with ultrasound to assess its size and structure. Not all the liver can be imaged however. Obtaining a liver biopsy remains the ‘gold standard’ when trying to answer the three questions above. This is because different causes of liver disease can lead to characteristic patterns that can be seen when the liver is assessed microscopically. Liver biopsies are performed under ultrasound guidance and it is advisable that at least 2 sites are sampled. Liver biopsy samples are sent off for evaluation. Bacterial cultures can also be run from the liver samples. Different causes will require different treatments. There are many different causes of liver disease/ failure. 1. Toxic causes e.g. Ragwort poisoning, Mycotoxins. 4. Metabolic causes e.g. hepatic lipidosis, hyperammoniaemia. Infectious causes will often require antibiotics. If non-septic inflammation is present, corticosteroids can be used. Supportive therapy includes: fluid therapy, dietary changes (low protein, high branched chain amino acid diet), liver support e.g. Milk thistle, SAM-e, Vitamin E.
Unfortunately, for cases like Ragwort poisoning, there is no specific treatment as the liver changes are usually too advanced and irreversible once it is diagnosed. If other toxins are suspected as being the cause e.g. Mycotoxins, it is advised to remove the horse and herd mates from the pasture that they are grazing on, or remove the suspected feed stuff that contains the toxin. Tests can be performed on pastures/ feed stuffs to assess for toxins but it is often hard to diagnose. 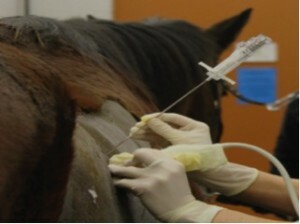 In these cases, herd mates should be blood tested as a screening method to see if they have been affected. Prognosis for horses with liver disease depends on the stage at which liver disease has been diagnosed and the extent of liver fibrosis. If liver regeneration can occur, then with appropriate therapy and rest, the prognosis is more favourable. It must be noted that it can take several months for liver enzymes to normalise. It is recommended to carry out repeat blood tests +/- repeat biopsies during the rehabilitation period to monitor progress.